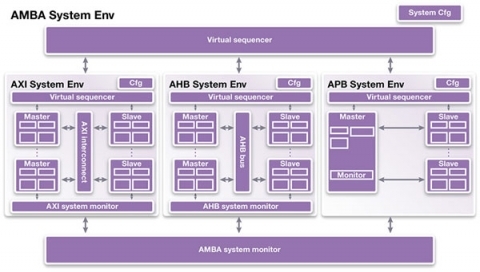 Synopsys VC Verification IP (VIP) for ARM® AMBA® AXI™ provides complete protocol support for AXI3™, AXI4™, AXI4-Lite™, AXI4-Stream™, ACE™, ACE-Lite™ , AHB™ and APB™ interfaces. With a comprehensive set of protocol, methodology, verification and productivity features, users are able to achieve rapid verification convergence on their AMBA-based designs. Testbench development is accelerated with the assistance of built-in verification plans, example tests and sequence library. Built-in coverage points integrate with the verification plans showing progress towards achieving coverage goal.